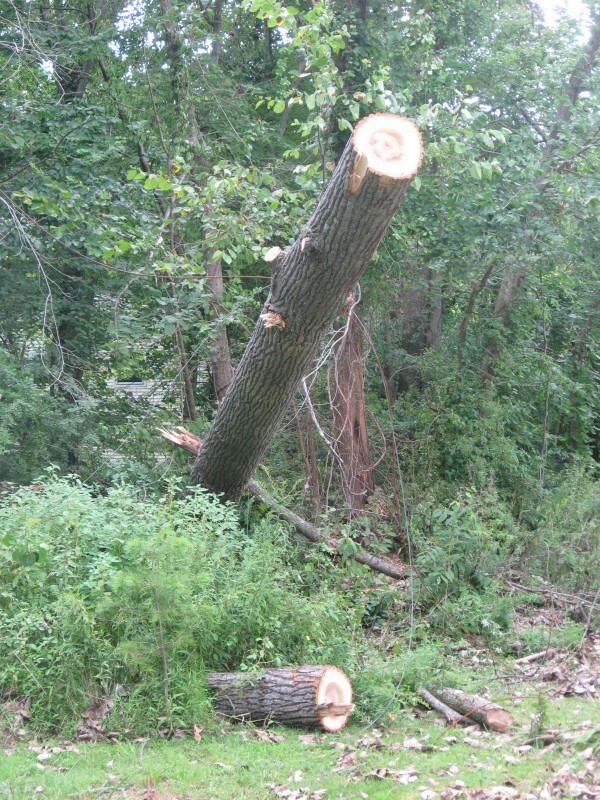 We only lost one tree Thursday night, at least not two as I initially feared. The high winds didn't last very long, maybe 15 minutes as they passed over my neck of the woods, but it was enough. The brush is too thick for me to see the base, but I don't think it snapped. It's 19 inches across where it was cut, and even thicker approaching the base. I think it simply fell over, since it grew by the stream separating us from the neighbors, where the perpetually wet soil is weaker and roots can't grow as deeply. The tree had fallen halfway across the road, and much more horizontally than this picture would indicate. After cutting off the top half and branches on the lower half, a crew used steel cables (you can still see them) to pull the lower half back onto our property. Even if we used our fireplace, it would be a lot of work for me to go at it with a chainsaw. Maybe a company with a woodchipper will come cut it up if we let them have the wood.